May b the aircraft was in KHI to pick up goods for Pakistani Troops stationed in Sudan under the UN. This is what a friend of mine was assuming in Pakistan. * According to a number of news channels, crashed aircraft's black box has been recovered. ARY News channel says black box not recovered so far. * Preliminary investigation report has been sent to defence ministry. * Aircraft manuals and instruments were all in Russian language. * Aircraft's own Russian engineers checked the aircraft and cleared it for flight. * Aircraft operator's own engineers after checking the aircraft give it clearance for flight, according to spokesman quoted by news channel. I think in cases of air accidents, CAA should issue a proper press release to print and electronic media so that CAA officials statements do not get misquoted on news channels. 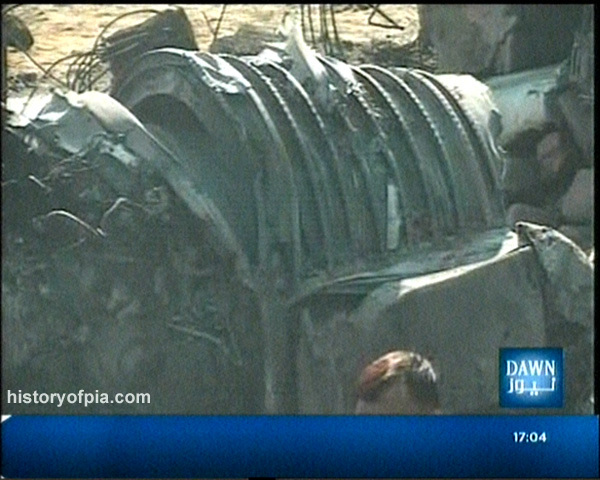 Images from crash site shown on Pakistani news channels on November 28. Looks like one of aircraft's four engines. 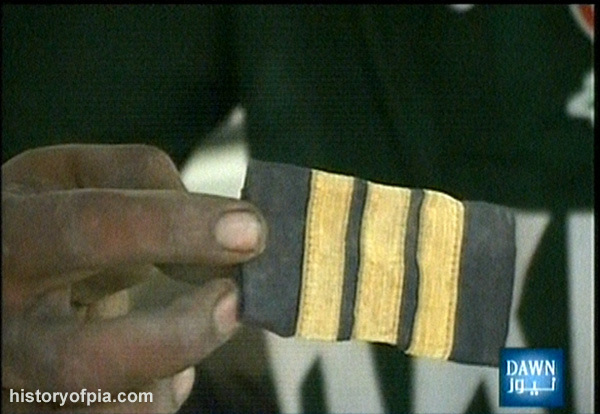 Shoulder stripes belonging to one of unfortunate crew members of ill-fated aircraft. As usual, you are the sober and sane voice around here. Of course the two FE's must have made checks of the engines during the turn-around. This is completely routine. Whatever the cause of the fire (they were not able to put it out it seems since it was glowing before impact) he should have been able to fly out on three engines --even two engines. This is an old but tough work-horse. Like the JS crash where he should have been able to climb out on one engine with ease, the crash here raises many questions. Did they identify the correct failed engine? Had the gear been taken UP to reduce drag (Multan and JS)? Was his rudder input incorrect, exacerbating yaw (Multan and JS)? Were they over-weight (Multan) or very close to MTOW? It must have been a hot night in Karachi (Multan, a very hot day). What reduced-thrust (de-rated) setting were they using? In the Multan case I believe they over-boosted by accident causing the over-heat light to come on and setting off a fire. Interesting that in the Qantas A380 incident they are reports that they were using full-power for the long-distance flights (heavy with fuel) which was one of the reasons for the disc failure. I thought take-off's these days were always de-rated where you choose a temperature higher than the ambient one. The FMS will give you the parameters of de-rated thrust. All very sad. Lives lost are never easy to comprehend, or digest no matter the place or the nationality. After all, they were sons, fathers and brothers too, just like we all are. The ill-fated aircraft was allowed to depart without checks performed by ground engineers , according to preliminary report. (which company's ground engineers ?). How can anyone give such a statement until all documents and procedures have been scrutinized . As per legal requirement the aircraft engineers must have a valid license on that particular equipment to certify the aircraft ,they could be a third party technical handling agent ,such as PIA in case of OMAN air and Kuwait airways flights to Pakistan where PIA aircraft engineers certify their aircraft so it depends on the agreement between companies ,however in case of Russian equipment the aircraft engineers invariably must be on board or stationed at Karachi ,but were in all probability Russian , as there are rarely any third party technical certification companies for Russian aircraft . There is nothing wrong in that as long as the engineers and crew are conversant and its a normal procedure . Again a normal legal procedure to certify the release to service certificate . * CAA is not responsible for checking each & every aircraft, according to a spokesman quoted by a news channel. (Strange statement probably misquoted by news channel). Techically its right as CAA does not and cannot have a force of its own engineers to check every transit certification.No regulatory authority in the world can do that.Imagine a transit certification by companies engineers then rechecking by CAA ,multiply it by all the flights and it would be a nightmare.However the responsibilty of equipment coming and landing into Pakistan airspace IS a responsibility of CAA and for that proper documentation,information ,qualifications and licenses of the persons who shall certify the aircraft in Pakistan has to be submitted by the operator.Furthermore CAA and other EASA ,FAA authorities do carry out spot checks and inspections routinely on random aircraft . Thats perfectly normal and legal and the way it should have been done.. Yet another classic case of non professional statements being spread by media ,at least they should ask an expert in the field otherwise every reporter thinks he is the Sherlock homes digging out some wrong doing . 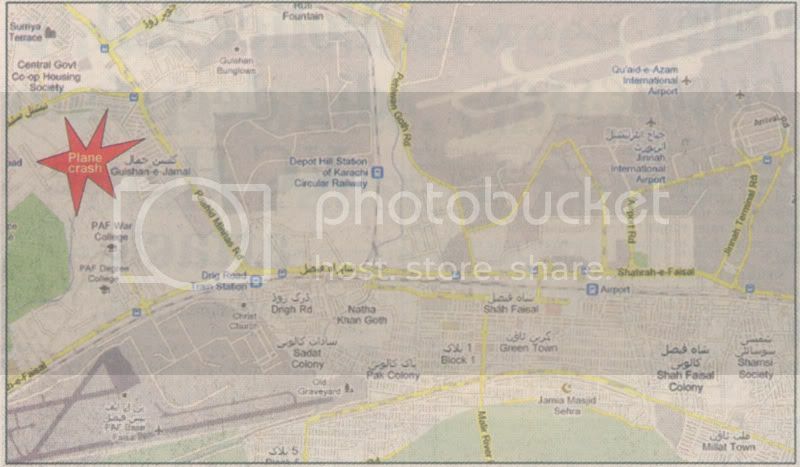 * The aircraft took-off from Karachi Airport at 1:48AM (November 28). * The aircraft caught fire but the its crew did not have enough time to inform airport about the problem. * The aircraft crashed within minute after take-off from Karachi. * Black box not found so far. The aircraft section with black box is believed to be buried under debris of collapsed building structure. A team of Georgian company Sun Way representatives is also arriving in Pakistan. An informative news report in November 29 edition of English daily 'DAWN'. KARACHI, Nov 28: The crash that occurred in the early hours of Sunday was so close to the airport that air traffic controllers actually saw the Russian-made cargo plane (IL-76) burst into flame and fi nally go down in a fireball in a nearby residential area, an official of the Civil Aviation Authority (CAA) told Dawn. The gap between the takeoff and the crash was so brief that the aircraft had not yet been handed over to the radar control and was still within the range of the ATC, they said. However, they added, the pilot made no contact with the air traffic controllers regarding an emergency situation or fire etc. This is the second aircraft that has crashed within minutes after take-off from Karachi airport within a month. On Nov 5, a small chartered aircraft of the JS Air crashed in a military facility minutes after take-off, killing all 21 people on board. Both the crash sites are almost in the same direction from the airport, and one of the thoroughfares of the city ÃƒÂ¢Ã¢â€šÂ¬Ã¢â‚¬Â Rashid Minhas Road ÃƒÂ¢Ã¢â€šÂ¬Ã¢â‚¬Â runs between the two sites, which are hardly a kilometre or so away from each other. Prior to these two tragedies, a commercial flight of Airblue had crashed in the Margalla Hills in Islamabad a few months back just before landing in bad weather, killing all passengers and crew members. A spokesman for the CAA told Dawn that the Ilyushin 76 freighter plane was owned by a Georgian company ÃƒÂ¢Ã¢â€šÂ¬Ã¢â‚¬Â Sun Way Airlines ÃƒÂ¢Ã¢â€šÂ¬Ã¢â‚¬Â and it arrived here from Fujaira in the United Arab Emirates on Saturday afternoon (3pm). He said that after staying here for around 10 hours, during which it refuelled and relief cargo was loaded onto it, it took off at 1.48am on Sunday. He said that the air traffic controllers saw the plane burst into flame and crash in a fireball in the naval residential colony in Dalmia around three kilometres from the airport across Rashid Minhas Road. He said that a team to probe the plane crash had been constituted and it would be headed by the chief investigator of the CAA, Air Commodore Khawaja Abdul Majeed. He said that the Shaheen Air Port Services (SAPS) was the local handlers for the flight at the airport while the plane had been chartered by the Executive Air. A representative of the SAPS said that the cargo comprising relief goods tents, etc, were loaded onto the plane in the city and the aircraft had also been refuelled. He, however, was not sure if the aircraft had also brought any cargo to the city or any cargo had been taken off during the planeÃƒÂ¢Ã¢â€šÂ¬Ã¢â€žÂ¢s stay here. He said that the cargo had been booked by, and belonged to, the Vision Air and they could tell who was sending the cargo or who would have received it in the Sudanese capital Khartoum. However, it is unclear as to why tents were being sent to Sudan from here despite the fact that Pakistan is reeling from the worst-ever natural disaster and a number of flood-affected people are still without shelter. Besides, no calamity or disaster in Sudan that requires international help has so far been reported in the media. Flight Operations Officer Javed of the Executive Air said he had no information about the cargo and the plane. He referred to another senior official, Arooj Mirza, who did not respond to calls made by this reporter on his cellphone. Responding to Dawn queries, Mr Sirjad of the Vision Air said his company was not in any way related with the aircraft that crashed or the cargo that it was carrying. In reply to another question as to why his companyÃƒÂ¢Ã¢â€šÂ¬Ã¢â€žÂ¢s name was being mentioned by other companies, he said that this aircraft was to come here last week, probably on Nov 24, but the flight was cancelled and it did not arrive. His company had handled the ground arrangements of the aircraft last time (when it did not come), so probably people felt that this time also his company was involved. Meanwhile, General Secretary of the Pakistan Airlines Pilots Association (Palpa) Capt T.M. Rabbani said that IL-76 aircraft did not enjoy a good record globally as far as safety was concerned. He said that three accidents in around four months ÃƒÂ¢Ã¢â€šÂ¬Ã¢â‚¬Â and two within a month ÃƒÂ¢Ã¢â€šÂ¬Ã¢â‚¬Â put a question mark over the performance of the aviation regulator whose job it was to ensure safety of the air passengers as well as the people living on the ground. CAA sources said that according to the International Civil Aviation Organisation (ICAO), every aviation regulator must follow the Foreign Aircraft Operations Surveillance Programme and must have its certified inspectors to carry out inspections. The CAA has just one certified inspector, Tariq Khoso, who had undergone the prescribed inspection training in Bangkok in addition to some advance trainings, they added. After his return he had also grounded a few aircraft which did not meet the required criteria. The sources said that Mr Khoso was not being made to do his job. The sources said that there are eight posts of inspectors in the CAAÃƒÂ¢Ã¢â€šÂ¬Ã¢â€žÂ¢s Flight Standards Department. Three inspectors had been made non-operational while four posts were lying vacant, they added. 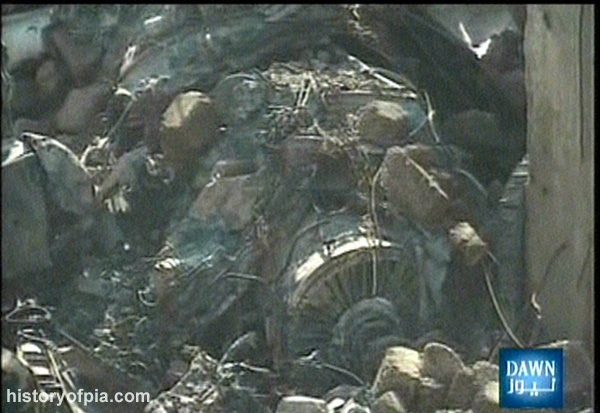 KARACHI, Nov 28: The death toll in this monthÃƒÂ¢Ã¢â€šÂ¬Ã¢â€žÂ¢s second air crash in Karachi rose to 11 after three bodies were retrieved from the debris at the site on Sunday. 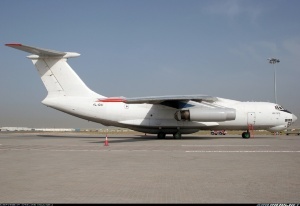 The Russian-built IL-76 medium-range cargo aircraft carrying relief goods destined for Sudan crashed minutes after take-off from the Jinnah International Airport at around 1.48am. About three weeks earlier, 21 people, mostly employees of an oil company, died when a small chartered aircraft crashed on Nov 5 on the premises of the Central Ordnance Depot minutes after take-off. The cargo plane which crashed on Sunday had cleared the COD, Rashid Minhas Road, Gulshan-i-Jamal and Majeed SailorsÃƒÂ¢Ã¢â€šÂ¬Ã¢â€žÂ¢ Residential Estate before plunging into the Naval Housing Scheme at an under-construction site between three-floor populated blocks. A number of residents of Gulistan-iJauhar and Gulshan-i-Jamal saw a large fireball in the air which soon hit the ground with a loud bang. As the plane carried fuel for an eighthour flight to Khartoum, the crash caused a huge blaze which fire-tenders of the navy and city government took about two hours to douse. Eight members of the planeÃƒÂ¢Ã¢â€šÂ¬Ã¢â€žÂ¢s Russian crew and three labourers on the ground were killed. Another labourer, Mohammad Rais, was admitted to the Civil Hospital with over 50 per cent burns. The workers who died have been identified as Khuda Buksh, 28, Ajaz Husain, 27, and Shahid, 21, of Multan. They had arrived at the construction site a day earlier, police said. Hundreds of people managed to slip into the crash site when gates of the colony were opened for ambulances. They obstructed rescue and relief efforts. The nearby Dalmia Road was also clogged by hundreds of people who wanted to catch a glimpse of the area. Some personnel working at the site complained that some people had taken away pieces of the plane. ÃƒÂ¢Ã¢â€šÂ¬Ã…â€œPerhaps the incident took place so suddenly that the pilot didnÃƒÂ¢Ã¢â€šÂ¬Ã¢â€žÂ¢t get a chance to inform the Control Tower and no communication between them took place,ÃƒÂ¢Ã¢â€šÂ¬Ã‚Â a spokesman for the Civil Aviation Authority said. The freighter owned by the Georgian Sunway Airlines had landed at the airport at around 3pm on Saturday, having arrived from Fujaira in the UAE. Btw, so far registration of the crashed Il-76 is not confirmed. According to some sources on the web it was registration 4L-MGC but according to some other sources it was 4L-GNI. I guess it was 4L-MGC because after the accident a number of Pakistani news channels were saying that the ill-fated aircraft was operating cargo flight number 'MGCC-4412'. I think the news channels' correspondents were mixing up aircraft registration '4L-MGC' and flight number '4412'. According to some eye witness reports, not only an engine but apparently a considerable part of aircraft wing/fuselage was seen on fire before it struck the ground. Probably an engine fire explosion ruptured fuel lines and ignited them and fire damaged aircraft's wing control surfaces making it difficult for crew to maneuver the aircraft. In amateur video clip, the ill-fated Il-76 certainly appears like a small ball of fire before hitting ground. Engine bird ingestion is also being considered by some aviation analysts. I think investigators will certainly check crashed aircraft's engines to see whether any of them ingested any birds or not. Crash location indicated in today's (November 29) edition of English daily 'DAWN'. I just love the remark about the CAA starting a probe! The fact that there is one flight inspector and other safety-related positions are vacant is downright scary. If the CAA cannot recruit suitable personnel in Pakistan, engage an external company. Air safety is too important a subject to stand on a false sense of pride. Don't we engage foreign experts/consultants for far less worthy causes? If he had an uncontrollable fire as it seems which was not put out but spread (remember the Concorde?) he did not have a chance. But he seems to have kept the aircraft remarkably straight on the extended center-line as the pictures show. I was shocked to hear on the news that another fatal accident had taken place in Karachi. I hope the labourers families are provided adequete and fair compensation rapidly. Abbas, thanks for the summary regarding the three incidents related to flights originating from Karachi. Clearly the three causes may be completely independant and isolated however it is up to the regulatory authority (CAA in this instance) to ensure that operations are safe and that undue risk is not being taken either by operators or organisations involved in providing support services. The buck stops with CAA to ensure that operators, proceedures etc are audited and that air safety is maintained and regulated in Pakistan. It may just be a statistical blip but 3 incidents in such a short timeframe fall outside of the bell curve/standard distribution for such incidents, particularly for the number of flight hours undertaken in Pakistan. Whatever peoples own sentiments are about the EU/PIA ban, such regulatory action is taken for a reason - to prevent accidents and therfore loss of life. Maybe CAA needs to follow suit. CAA really need to take a long hard look at air safety in Pakistan before their reputation and/or competence is questioned. I also agree that CAA should be issuing official press releases rather than the media perpetuating "flaney ka flana" rumours. Its unfortunate that were getting all these fly-by-night ghost airlines coming here in full force. Nothing is known about them, their safety procedures, type of crew, condition of the a/c etc. Its not surprising the EU and US have banned them from their airspace. According to a Ukrainian website (kp.ua) the registration of ill-fated Il-76 was 4L-GNI. The crashed aircraft's pilots were from Ukraine. In crashed aircraft's cargo flight number 'MGC-4412' reported by some Pakistani news channels 'MGC' could very well be three-letter ICAO code for Georgia-based aircraft operator Sun Way. And, according to same Ukrainian website kp.ua, 4L-GNI had recent history of problem with at least one of its engines. "4L-GNI had problems with the engine: it did not start and hang", the Ukrainian website says. There you go. Atleast one report is saying incident caused by a bird injestion.